Well, Tim Kaine is certainly turning into quite the liability for the Clinton campaign. America’s vice presidential nominees get just one chance to go head-to-head before election day, but it looks like this year’s debate could be missing a pretty important player. Earlier today, the Clinton campaign was thrown into a complete and total panic when Tim Kaine realized that the VP debate and his final showcase for his puppeteering class are both tonight. Really, Tim? What a completely irresponsible move. The debate is scheduled for 8 PM tonight at a college in Farmville, Virginia. 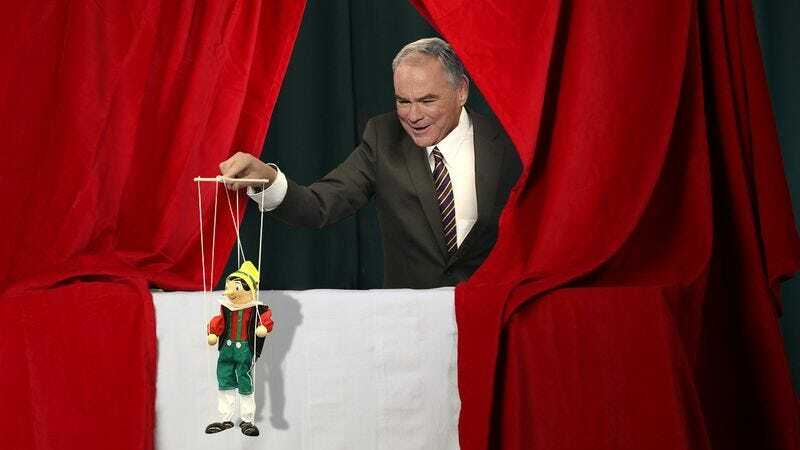 But also tonight, in his hometown of Richmond, Senator Kaine and eight classmates are slated to present the final projects from their Puppetry Fundamentals course at the local community center. It’s a jam-packed cabaret of monologues, skits, and songs, and Kaine claims he’s had the event on his calendar long before he joined Clinton’s ticket. His staffers have urged him to drop out of the showcase ASAP, but with the Act I choreography complete and having already offered to play the rain stick for a classmate’s presentation, things aren’t looking good for the campaign. It’s shocking that Kaine could leave Hillary in the lurch like this, but insiders say he is seriously considering skipping the debate. Kaine spent every Tuesday night this summer creating his puppet character, Pierre—a grumpy Frenchman who is obsessed with cheese. He built the puppet from scratch and spent countless class hours exploring ways to embody Pierre’s personality both physically and vocally. As Kaine reportedly explained to Clinton in their emergency debrief early this morning, he views this as more than just a performance—it’s a celebration of everything he and his troupe have learned together. Wow. If Tim ends up losing this election, he will only have himself to blame. Making a bad situation even worse, all of Kaine’s efforts to compromise have been frustratingly futile. He offered to miss the post-show cast party and go straight to the debate if they could push it back to 11:30 p.m., but the Trump-Pence campaign refused to budge. And while he did ask his instructor if it was possible to move the showcase to a later night, the community center is completely booked up next week with a Japanese drumming workshop. Yikes. Unless Kaine can figure out a way to be in two different places at once, it looks like this campaign could really be headed for trouble. Let’s just hope the senator decides to honor his commitment to Hillary and this election—there’s still a little time for his class to replace him in the closing group number. But until Tim makes his call, the entire 2016 election hangs in the balance.